We architected and built this set of network analysis tools for a group of technologists based in Washington, D.C. representing the healthcare and defense industries. The toolkit is a full-stack solution built mostly using traditional tools like Ruby on Rails and various ECMA scripting formats, but the underlying data model is based on triples. Tripledex is offered in partnership for Federal Government Clients through Berico Technologies. The clip below demonstrates one solution created for evaluating large social networks from the perspective of a single node. (video may take a moment to load). 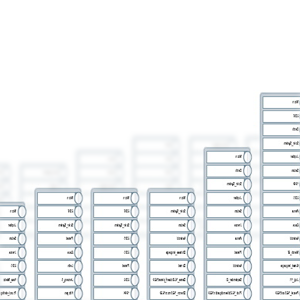 This visualization is of network data from the single-node perspective. Strength of relationships between nodes are visualized as circles, where each circle represents a relationship stored in the data. For example, if the nodes are people and two of those people (nodes) have many individual records in the data about their relationship -- such as they went to college together as one record, and they work the same company as a second record, and so on -- each of those relationships will appear as one of the circles on the line connecting the two nodes (people). A type of relationship can be weighted for significance, which results in the prioritization of that relationship with respect to order of appearance in the graph. Also, when a large number of relationships exist in the data between two nodes, the number of circles compress into concentric rings which indicate that many relationships are bundled (or "coiled") together between two nodes. (Click the image to enlarge in a new window). 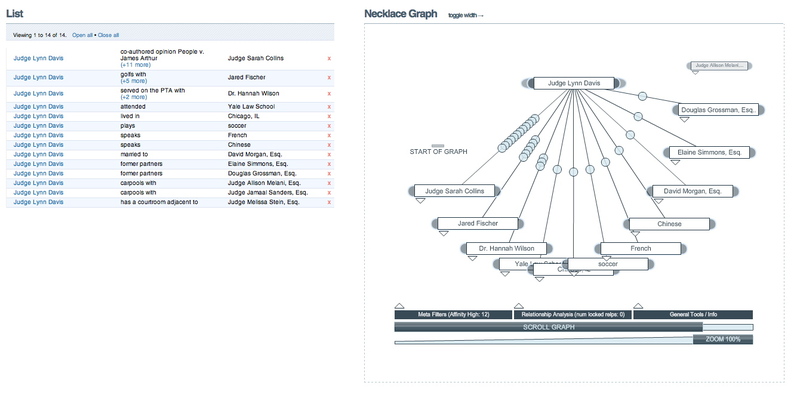 This visualization interface works in tandem with the Necklace View as seen in the previous image, but it has a bit more linearity to it; and the two end nodes are close together so the relationships can stack to form a bar graph count. The same query results that feed Necklace also feed Stacks, but each view highlights slightly different characteristics of the data.